The Bronx  is one of the five boroughs that make up New York City. The Bronx - sometimes abbreviated as BX in the city, and nicknamed The Boogie Down - with a population of 1,455,444 (2015 Est), is the only one of the five New York City boroughs that is mainly on the mainland of the United States, and not on an island (there are smaller adjacent islands that are part of the Bronx, and also an extremely small portion of Manhattan, called Marble Hill, lies on the mainland). The Bronx was originally part of Westchester County but was gradually annexed by New York City. The Bronx was completely incorporated into the city in 1898. The Bronx is the only borough with the word “The” commonly associated with its name. That’s because in the early 1600’s, a Swedish settler named Jonas Bronck bought the land from the Native Americans who occupied the territory at the time. Whenever other land owners in the area wanted to travel to that area they would call it “The Bronck’s Land”, after his family name. At first he planned to use the land to grow tobacco crops, but it had a marshy terrain and hills, and therefore couldn’t grow anything on it. The Bronx has a strong character all its own. It is the birthplace of rap/hip hop music and home to one of the country's most storied professional baseball teams, the New York Yankees, also known as the "Bronx Bombers." Many ethnic groups have called the Bronx home over the years. Arthur Avenue is still a center of Italian American culture in New York, and many claim it has a more authentic feel than Manhattan's Little Italy. The South Bronx is more of a struggling area, but is the center of Puerto Rican culture and life. University Heights and Morris Heights are largely Dominican neighborhoods, while Woodlawn maintains a large population of Irish immigrants. While the southern and central Bronx are mostly comprised of apartment buildings and densely built, the physical environment of the Bronx is more varied than what is normally portrayed in the popular media. For instance, Riverdale is a residential neighborhood of mostly detached single family homes located on bluffs overlooking the Hudson River. It looks more like a quiet suburb in The Bronx. Bronx Park and Van Cortlandt Park are two large and notably tranquil green spaces. City Island, located in Long Island Sound but officially part of the Bronx reminds people more of a small New England fishing village and is worth a visit. And there is a traditional downtown area called "The Hub" at 149 St. and Third Avenue. While not as large or extensive as the downtown area of major city, a lot of stores are in that location and it is more than just a neighborhood shopping district. Geographically, The Bronx has a large number of hills. It is possible to stand on a street corner and look way down over a cliff toward the elevated train line that is itself 30 feet above ground. Many streets, especially in the West Bronx north of Yankee Stadium, have sections with steps instead of sidewalks and pavement, similar to San Francisco. The Bronx does have a few struggling neighborhoods to be sure, but it is also an area with nice middle-class neighborhoods, and a borough with a vibrant and diverse culture. One can get into the Bronx from Manhattan and other boroughs (except Staten Island) easily by taking any of several subway lines (The 1, 2, 4, 5, 6, B, and D). The Harlem and Hudson Lines of the Metro North commuter railway, which originate in Grand Central Terminal and stop in Harlem at 125 St and Park Av, also traverse the Bronx, with various stops including Botanic Garden, next to the New York Botanic Garden, and Fordham (a transfer point). Express buses run from Midtown Manhattan (with the BxM18 offering Downtown service as well) to various parts of the Bronx, and are a better bet than a taxi. Local MTA (Metropolitan Transit Authority) bus connections with Upper Manhattan and parts of Queens also exist. It is possible to drive across one of several bridges from Manhattan or the three bridges from Queens, and points north are accessible via several highways (including I-87, Bronx River Parkway, Hutchinson River Parkway, and I-95. Taxis are not as easily hailed off the streets of the Bronx, or any of the other New york City boroughs, as they are in Manhattan. In the Bronx, it may just be quicker to call a cab and have it pick you up. If traveling to/from Manhattan, be aware that taxis between Lower Manhattan or Midtown and the Bronx can be expensive. Pedestrians can walk across any of the bridges that connect the Bronx and Manhattan. The bridges that connect the Bronx and Queens, with the exception of the RFK Triboro Bridge, cannot be crossed by pedestrians; vehicular traffic only. The Bronx has good subway coverage but all lines are mainly north to south, with the subway lines designed more for access to Manhattan than crosstown travel in the Bronx, and many of its bus lines are slow and overcrowded at times. Many people who need flexibility in getting across the Bronx drive; however, the notorious overcrowding on the Cross-Bronx Expressway sometimes reduces such crosstown travel to a standstill. Another option is Metro-North Railroad. It only serves limited sections of the Bronx, but those tend to be the areas without subway service. (There is the Hudson Line in the West Bronx, and the Harlem Line in the central section of the Bronx). The fares are higher than the subway, and the trains don't run as frequently, but they offer less crowding. (Plus, on the weekends, a "CityTicket", which allows a trip within the city boundaries, costs only $4.00. In general, with sufficient planning and time, you can enjoy the borough through a combination of subway and bus travel and walking. A bus map can be found at: http://mta.info/nyct/maps/busbx.pdf. Buses can also be tracked on the MTA's BusTime site. 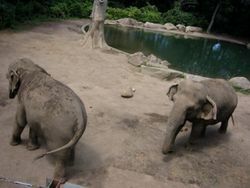 Bronx Zoo, (718) 367-1010 . A world-class zoo featuring over 6000 animals. As with any big city, there are occational break-ins, so be careful with your car and stow or carry valuables with you to help avoid this possibility. Note that the Zoo can be easily accessed from the 2 & 5 trains at West Farms Square/East Tremont Av., E 180th Street, or Pelham Parkway-White Plains Road. The BxM10 and BxM11 buses also operate in the vicinity. New York Botanical Garden, Bronx River Parkway at Fordham Road, (718) 817-8700. 48 magnificent gardens and plant collections on a 250-acre historic site. It can be accessed by the 2 & 5 trains at West Farms Square, E 180th Street, or Pelham Parkway-White Plains Road or by Metro-North at the Botanical Gardens station. Wave Hill, 675 West 252 Street, (718) 549-3200. Public garden and cultural center overlooking the Hudson River. Orchard Beach "The Bronx Riviera". 1.1 miles of artificial beach created in the 1930's. Located in Pelham Bay Park at the western end of Long Island Sound. The Bx5 and Bx12 serve it during the summer. City Island has a good nightlife and is served by the Bx29 from the Pelham Bay Park subway station. Edgar Allan Poe Cottage Poe Park, Grand Concourse at Kingsbridge Road, 718 881-8900, . The small wooden farmhouse, built about 1812, once offered unobstructed views of the rolling Bronx hills, perhaps even to the shores of Long Island. It was Poe's home from 1846 to 1849, the last three years of his life. He wrote some of his most famous works, including "Annabel Lee" and "The Bells." Administered by the Bronx County Historical Society since 1975, the cottage is restored to its original appearance, with authentic period furnishings. There's a film presentation and guided tour. It is served by the B & D trains at Kingsbridge Road. Yankee Stadium, 161 St and River Ave. Home of the New York Yankees baseball team . The old Yankee Stadium, "The House That Ruth Built", is no longer in use, and is now replaced by the new Yankee Stadium next door. The Stadium has strict security policies, and as such backpacks and camcorders are not allowed inside (only bags under 14" permitted). Monument Park pays homage to the great, Yankee legends of baseball, and is located behind center field. Monument park officially closes 45 minutes before game time, but is often times closed sooner if the crowds are large enough. If visiting Monument park is a priority, best bet is to arrive close to when the gates open. It is served by the B, D & 4 at 161st Street-Yankee Stadium and the Metro-North Station at 153rd Street-Yankee Stadium. You can also take a stadium tour for $20. Maritime Industry Museum at Fort Schuyler, SUNY Maritime College, 6 Pennyfield Avenue (the end of Pennyfield Ave; under the Throgs Neck Bridge), ☎ 718 409-7218. The main exhibit area encompasses the history of seafaring from the ancient Phoenicians to present day steamship and passenger ship lines. Exhibitions include paintings, models, tools and navigational instruments documenting progress from the earliest sailing vessels to modern technology. Lovely waterfront location too. It can be accessed by the Bx40 along Tremont Avenue. Bronx Museum of the Arts, 1040 Grand Concourse at 165th Street, ☎ (718) 681-6000, http://www.bronxmuseum.org/. Mon, Tues, and Wen closed/ Opened 11am-6pm Thu, Sat, and Sun, Fri 11am-8pm. Suggested Admission $5 Adults/ $3 Students and Seniors. The Museum highlights contemporary urban art, and focuses on different dynamic local artists. Easily accessible by the B, D and 4 subway trains. Valentine-Varian House (Museum of Bronx History), 3266 Bainbridge Avenue at East 208th Street, ☎ (718) 881-8900, Opened Sa: 10am-4pm & Su: 1pm-5pm. Admission: Adults $5, Seniors and Children $3. It’s the last farmhouse in The Bronx from the mid 1700’s. Exhibitions and public educational programs focus on the borough’s chronologic history. Bartow-Pell Mansion Museum, 895 Shore Road, ☎ (718) 885-1461, Wed, Sa, Su: 12pm- 4pm, $5 adults, $3 children, students, and seniors. Depicts the Pelham Bay Park of The Bronx neighborhood as it once was centuries ago. The house is one of the only country estates left, and is now surrounded by urban scenery. The Bronx has over 75 parks including a few of the largest ones in all of New York State. One fifth of the borough’s land is park space. Van Cortlandt Park, Broadway, Jerome Avenue, City Line, Van Cortlandt Park South. It is the fourth largest park in New York City and home of Americas oldest golf course. The Van Cortlandt House is the Bronx’s oldest building. The largest freshwater lake in all of NYC is in the park. It also has numerous sports fields and ball courts, children's playgrounds, running tracks, and the Riverdale Equestrian Center. During the summer time you’ll find the locals barbecuing and throwing parties in the park. Crotona Park, Fulton Avenue, This park contains the largest and deepest public swimming pool in New York City. The Bronx has many exciting celebrations that occur throughout the year. The Bronx includes the "real Little Italy" in New York, centered around Arthur Av. near E. 187 St. Good shopping in Italian foodstuffs is to be had in that neighborhood. Take the B, D, or 4 trains to Fordham Road. Transfer outside of either station to the Bx12 bus to Arthur Avenue. Or you can take the Metro-North to Fordham for the Bx9, Bx12 local, Bx17 or Bx22 to Arthur Avenue. Hunts Point Farmers Market Mrs. del Valle Square Memorial Plaza Southern Blvd and E 163rd St. Wednesday and Saturday, 8:30AM-5:00PM, June to November. Produced by Community Markets. Take the 6 train to Hunts Point Avenue or the B, D, or 4 trains to Yankee Stadium. Transfer outside of either station for the Bx6 bus. New York Botanical Garden Farmers Market- Inside the Garden at the Mosholu Gate off of Kazimioff Blvd. Wednesday, 10:00AM-3:00PM, June to November. Produced by Community Markets. Take the 2 to Allerton Avenue for the Bx25/Bx26 buses or take the B, D, or 4 trains to Bedford Park Boulevard for the Bx25/Bx26 buses. Sunday Market, 660 West 237th Street, every Sunday 9am-2pm, from early Aug-Nov. This is a great place for gathering and shopping for the best quality and fresh grown products in the area. Bronx Culture Trolley, meet the first Wednesday of each month (except Sept and Jan) at Hostos Community College, this is a free tour of the most entertaining and delightful spots in the whole region. This includes when music festivals and street fairs are in progress. Tour De Bronx, usually in late October, it’s New York State's largest free bicycling event. Riverdale Festival of the Arts, in late October, West 256th Street (btwn Delafield and Mosholu Avenues). This day is dedicated to all sorts of live music from jazz to rock and will have street merchants and foods. Bronx Week Parade, in late May, marching up Mosholu Parkway, This give all Bronxites the opportunity to show their pride and at the parade it has marching bands, schools, student groups, sports teams and much more. The Bronx is known to have the least expensive buys in all of New York City. Most of the areas are lively and noisy, but don’t let that stop you. Shopping at these places will give you the experience of The Bronx in a nutshell while saving money in your pockets. These areas are known for quality fashionable clothes and delicious food all at discount prices. Garden Gourmet, 5665 Broadway ☎ 718.796.4209 Open everyday 7am-11pm. http://www.gardengourmetmarket.com/. The best place in The Bronx for fresh produce, and is a neighborhood diamond in the ruff. Conveniently by the 1 train 231st station and BX7,BX9,BX10,BX20 buses. They have a diverse selection of cheeses and fresh bread loaves. Homemade dips, salsas, hummus, sushi, and other hot prepared ethnic foods and soups. Organic food prices are extremely cheap. Mamma Rosa's Cucina & Salumeria,1007 Allerton Avenue ☎ (718) 881-0242 M-Sa: 7am-7pm Su: 9am-2pm www.mammarosascucina.com/. One of the best delis in the Bronx area. Mamma Rosa knows how to bring Italian culture to the neighborhood. They give generous amount of meats on their sandwiches. Their special Pasta Sauces are always fresh and delicious, and different ones are made daily. The Candy Box & Gelato Shoppe, 5684 Riverdale Avenue, ☎ (718) 708-8008, Hours- Su: 11am-8pm, M-Th: 11am-7:30pm, F: 10:30am-4:30pm. This cutely decorated shop has various items like candy, dried fruit, nuts, sorbet, gelato, and frozen yogurt. The store hosts birthday parties and other special occasions. Plus the entire store is Kosher certified. 3 Floors Department Store, 350 E. Fordham Road (btwn Marion Avenue & Elm Place) ☎ (718) 367-2200. They have a range of different items, like clothes, home goods, watches and perfumes. The basement has designer shoes for as low as $5. Thats including everything from sandals in the summer to boots in the winter. Webster’s Close Out Center, 761 Lydig Avenue, ☎ (718) 292-3650. One can find a range of different objects to purchase here. Everything in the store is extremely inexpensive. They have racks of discounted clothing and bins of decor waiting outside for people to start rummaging through. Bay Plaza, Bartow Avenue & Baychester Avenue (Off the Hutchinson Pkwy & I-95). One of the biggest shopping centers in the area, including over 45 stores and 9 anchor stores. They have a handful of restaurants, jewelry stores, electronics and a move theatre. The Hub, 3rd Avenue & 149th Street, This area is one of the older shopping centers in The Bronx. Street stands pack the sidewalks with discounted products to purchase. This is where bargaining skills would be encouraged and practiced. Music fills the air from the booming record stores that offer a wide selection of Hip-Hop, and Latin genres. Frank Bee, 3435 E. Tremont Avenue. Open year round. Hours 9:00am-9:00pm M-Sa / 9:00am-6:00pm Su. ☎ 718.823.9792. Frank Bee's is one of the oldest costume shops in the New York area. Its old fashioned look give an authentic and vibrant feel. They sell costumes for all ages, all occasions, with many selections to choose from. Their merchandise is quality made with fair prices. City Girl Accessories, 247 W. 231st Street. ☎ (718) 796-2455. This store has unique gifts at discounted prices. Some of their sterling silver items can be as little as $12. The store has Mexican/ Midwestern style art, that is always up for purchase. They sell earrings, bracelets, necklaces, pendants, headbands, figurines, etc. As the birth place of hip-hop culture, the Bronx has numerous record stores. Though vinyl has disappeared from the shelves of regular record stores, many stores still sell used and new vinyl. The Rambling House, 4292 Katonah Ave. Serving the best Irish food in the Bronx. Take the 4 train to Woodlawn for the Bx34 bus. Mo Gridder's, 718-991-3046  in Hunt's Point is the best BBQ joint in the Bronx. Unfortunately, it is only open for lunch. Although it's outdoors, there is a dining area in the waiting area of auto repair shop next door. Hours: 10AM-5PM M-Sa. Carifesta Restaurant, 4251 White Plains Road, 718-325-2261. Has great Caribbean food but recently closed the dining area and is take-out only. Take the 2 train to 233rd Street. Great Italian food can be found near Arthur Avenue. Another fantastic hot spot for Italian food is a small neighborhood called Morris Park. The food is all authentic and reasonably priced. Artie's,  394 City Island Ave. A good steak, seafood, and pasta place. Reasonable prices. Take the 6 train to Pelham Bay Park for the Bx29 bus. Starving Artist Cafe & Gallery, 249 City Island Avenue, ☎ (718) 885-3779, . Local artists and crafters sell their unique work here, and musicians and bands play live music at nighttime. This coffeehouse makes excellent fresh cappuccino. The Bronx is one of the safest Boroughs in New York City. During the 70's and the 80's, The Bronx experienced two of the toughest decades in American history, it was considered one of the most dangerous places in the USA, now those days are far behind. The crime rate has declined by 71% from 1993 to 2010 and New York City safety agencies, NYPD and FDNY continue to protect the residents from criminal activity and fires. Make sure you have a map or a destination in mind before heading out to explore The Bronx. Unfortunately some of the New York City Hotels have failed to add The Bronx on the general travel itineraries, you can search online for a map highlighting points of interests or historical landmarks. Most of the neighborhoods in The Bronx are well lit and safe and you can venture out to some of the best restaurants in New York City. Always remain in populated well-lit areas. Do not buy counterfeit products (Gucci, Rolex) from strangers, is illegal. Don't interact with strangers who are behaving erratically or aggressively. Don’t leave important travel documents unsecured in hotel rooms. Only use ATMs at reputable banks. When using ATMs outside, be very aware of surroundings and quickly put away cash. Avoid using independent, non-bank ATMs found in delis or stores. During late nights, be wary of riding in empty cars, and select the car with a conductor present if possible. Don’t take CDs or DVDs from street vendors in your hand, avoid the sales pitch if you can. Avoid buying tickets from anyone on the streets. Approximately 75% are counterfeit. This page was last edited on 16 February 2019, at 09:17.